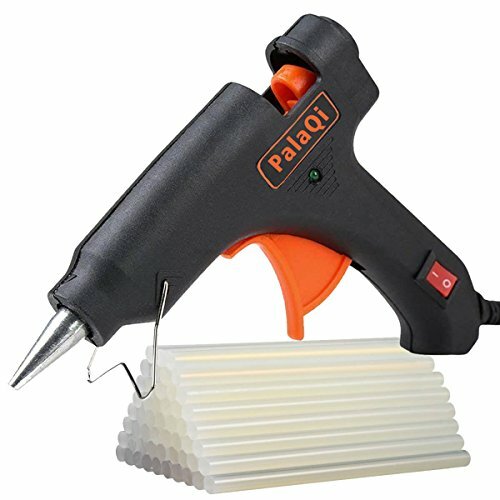 HEAT UP QUICKLY APPLICABLE ASPECTS:Hot melt glue gun fast heats up in 3-5 minutes and maintain constant temperature automatically provides a steady and constant stream of glue upon demand. making it an ideal adhesive for home, office and school DIY crafts projects including small cracks of furniture, household appliances, toys, shoes,metal, wood, glass, card, fabric, plastic,circuit board, ceramics and so on. SAFE AND EASY TO USE:100-240V of US plug, Safety and comfortable power switch with LED light mode,Quickly Ready for Use! you don\'t have to stop and unplug your glue gun between uses! No More worry about it burning you in case you forget to unplug it. With flexible support to keep the gun stable and upright, and allow you to use this gun in any angle. CONVENIENT FLEXBLE TRIGGER PROPULSION :Big Size and Huge Trigger, you can get a Full Grip with your whole hand Controls consistent glue flow to save glue sticks It is ergonomic and less fatigue for doing projects. Integrated Metal Stand/Holder is very stable to put the gun down while working on your project, so the hot tip doesn\'t rest on any surface. Easier-to-Maneuver than the smaller cheap ones, Perfect for crafts and repairs. 50PCS ENVIRONMENTAL-FRIENDLY GLUE STICKS：Including 50pcs environmental-friendly glue sticks, with super strong adhesive and easy cleaning properties to protect your health and items, high heating temperature, fast melting, smart temperature control keeps it at a consistent reliable temperature, no need worried that the glue gun doesn\'t keep hot enough for continuous glue to flow. Gets backed-up when the heating mechanism can\'t keep up. AFTER-SALE SERVICE:Package included PalaQi glue gun, Our MINI Glue Gun include 50 pcs glue sticks, User manual. Our MINI Glue Gun 100% satisfaction guarantee. If you have any questions about this product,please contact us,We will reply to you within 24 hours to solve the problem. Can't beat this price for 50 glue sticks and a gun that actually works!